I have recently learnt that the first rule of making granola, is that there are no rules. Homemade cereal, I find, is about throwing together your favourite flavour combinations and creating something so simple, yet so delicious. 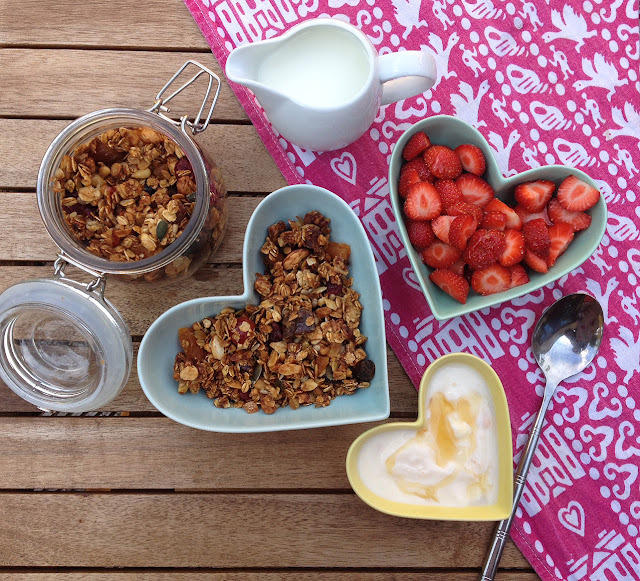 The satisfaction you get from eating a bowl of your very own granola with lashings of ice-cold milk is truly special. And it’s also a good excuse to go through your store cupboards and use leftovers of nuts, seeds and dry fruit you have lying around from various baking recipes. I used The Guardian’s ‘How to Make the Perfect...’ series as my main source of inspiration. To be honest the writer Felicity Cloake (what I wouldn’t do to have her job!) explored all the the different elements to the perfect granola for me. What she concludes is there are four main elements to granola: cereal, nuts & fruit, binding agents and sugar & spice, but as for what those four parts are made up of - that’s completely up to you. I used this as an excuse to play around with my taste instincts and my first attempt went pretty well and the smell from the honey, nuts and oats drifting through the house was an incredible bonus. Melt one tbsp coconut oil and a good 3-4 squeezes of runny honey in a small pan with a pinch of salt. 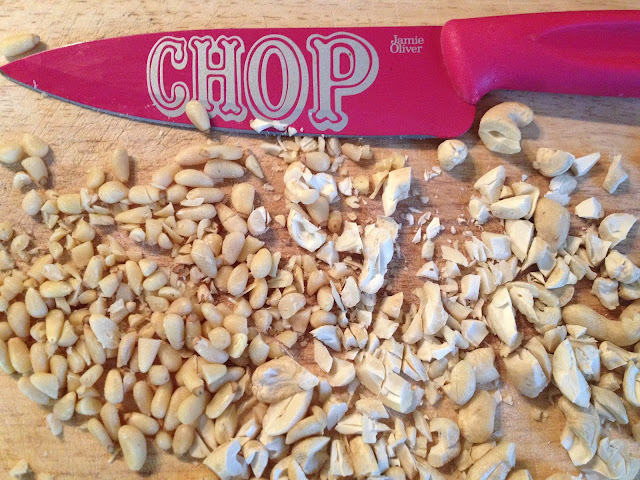 While that melts, combine 200g of jumbo rolled oats with your choice of 100g roughly chopped nuts - I chose cashews, pine nuts and flaked almonds (because that’s what was in my cupboard!). Add a handful of seeds (I had pumpkin to hand). 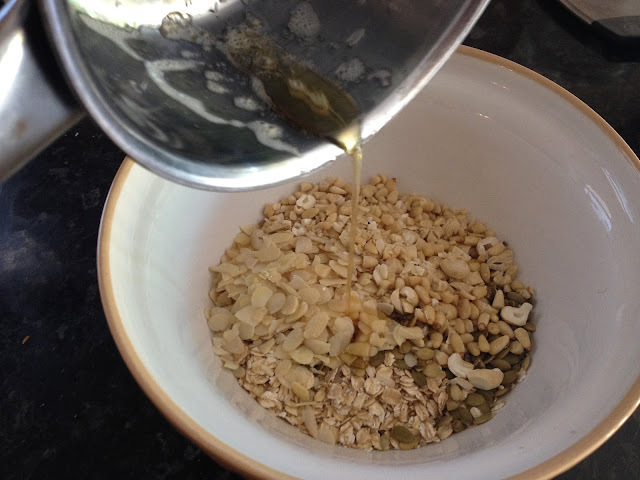 Once the coconut and honey syrup has melted and cooled slightly in the pan, stir through the cereal and nut mixture. Then whisk up an egg white and stir that through as well. Layer the sticky cereal and nut mixture on a baking tray lined with parchment and pop in an oven for 30min at 150 degrees. Every now and then stir up the mixture to loosen the granola. While it’s baking choose your 100g of dried fruit - I chopped up glacé cherries, dates and apricots for mine, as well as a handful of sultanas, and gave them a splash of vanilla essence which they absorbed while I mixed them quickly in a large bowl. TIP: Tie a bow around one of these jars of goodness and you have a thoughtful homemade gift! 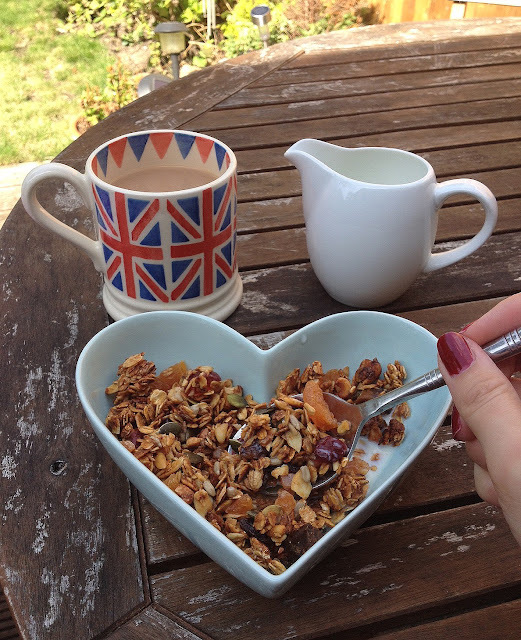 Eating homemade granola in your favourite bowl in the summer sunshine is a rather special moment. But just wait until you reach the end of your bowl with the remnants of the milk which has soaked up all the natural sugary goodness - that last gulp of burnt sugar milk tastes so good, and with a recipe that easy, you’ll never go back to shop-bought cereal again.